In life, delegation is fundamental. But it is difficult, especially when attempted internationally, as in the long delegation chains to the United Nations family and other global governance structures. There, much hinges on the design of delegation relationships. What prompts another entity to fall in line - and if it does not, what can be done? For international organizations, the conventional answer is simple: when designing institutions, member-states endow themselves with stringent control mechanisms, such as monopolization of financing or vetoes over decision-making in the new body. But as Tana Johnson shows, the conventional answer is outdated. States rarely design international organizations alone. Instead, negotiations usually involve international bureaucrats employed in pre-existing organizations. To unveil these overlooked but pivotal players, Organizational Progeny uses new data on nearly 200 intergovernmental organizations and detailed accounts of the origins of prominent and diverse institutions - the World Food Program, United Nations Development Program, International Energy Agency, Intergovernmental Panel on Climate Change, Financial Action Task Force, Joint United Nations Program on HIV/AIDS. When international bureaucrats have a say, they often strive to insulate new institutions against the usual control mechanisms by which states steer, monitor, or reverse organizational activities. This increases control costs for states, is difficult to roll back, and even produces bodies that powerful countries initially opposed. 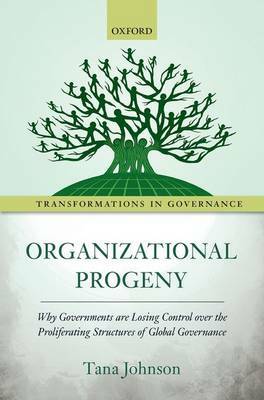 The result is a proliferation of organizational progeny over which national governments are literally losing "control". Johnson explores what this means for the democratic nature of global governance and how practitioners can encourage or staunch this phenomenon. Transformations in Governance is a major new academic book series from Oxford University Press. It is designed to accommodate the impressive growth of research in comparative politics, international relations, public policy, federalism, environmental and urban studies concerned with the dispersion of authority from central states up to supranational institutions, down to subnational governments, and side-ways to public-private networks. It brings together work that significantly advances our understanding of the organization, causes, and consequences of multilevel and complex governance. The series is selective, containing annually a small number of books of exceptionally high quality by leading and emerging scholars. The series targets mainly single-authored or co-authored work, but it is pluralistic in terms of disciplinary specialization, research design, method, and geographical scope. Case studies as well as comparative studies, historical as well as contemporary studies, and studies with a national, regional, or international focus are all central to its aims. Authors use qualitative, quantitative, formal modeling, or mixed methods. A trade mark of the books is that they combine scholarly rigour with readable prose and an attractive production style. The series is edited by Liesbet Hooghe and Gary Marks of the University of North Carolina, Chapel Hill, and the VU Amsterdam, and Walter Mattli of the University of Oxford.